For those of you who know me, you know I am always down to try new things. That being said, after months of hype about Phish coming to town for the first time in fourteen years, I knew I had to experience it for myself. 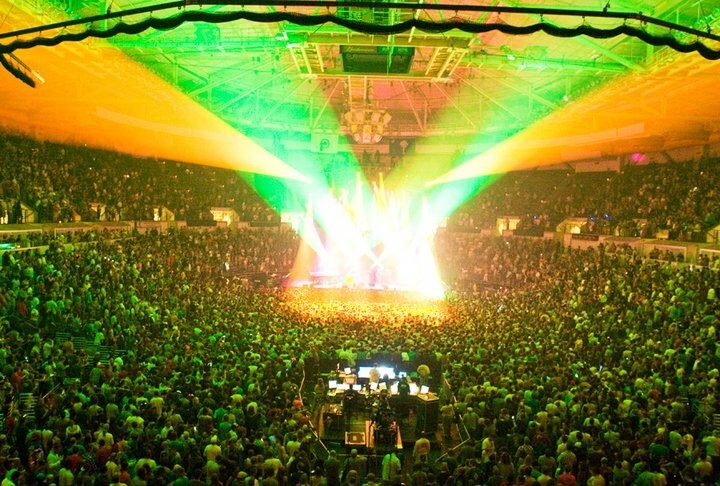 I had never been to a Phish show… as a matter of fact I don’t think I had ever heard one of their songs in it’s entirety. I wouldn’t say I disliked them, just never gave the tunes a fair chance. Depending on who you ask, Phish shows are either the greatest thing since sliced bread, or a bunch of zonked out hippies dancing to jazzy elevator music. I personally disagree with the latter and think if you stereotype Phish music/fans as such, you should have a listen and see for yourself. Within an hour of getting out of work Saturday night, I bought a ticket on Craigslist and was en-route to my first Phish show. While jamming out to the late MJ in the car, I thought to myself… man, I’m about to enter a genre like no other… I had no idea what was in store. One of my old friends from high school was in town for the show so me and my roommate met up with her. She and I hadn’t seen each other since back in 2001, ironically enough. She had traveled over 600 some miles to her 50 someth Phish show so, lucky for me, her and her phriends knew exactly where to go, what to do and when to do it. Without them, I would have been lost. I spent the first set of the show up in the seats looking down on roughly 11,000 of the happiest people I had ever seen. We were on the left side of the stage because “the Page side is the rage side.” The energy was bonkers, everyone was stoked. About a minute and a half into the first song I turned to my friend and said, “everything makes sense now,” and it did. I could see my roommate down on the floor with some of our friends, one of whom had a twister game as a cape. I planned on joining them later in the show, but for now, I wanted to soak in the scene. Between the lyrics, the jam sessions, the lights, and the amount of respect and adoration these guys received from their phans, I couldn’t hep but like them. I usually don’t post other people’s videos that I don’t know, but the show was too much fun not to share with you all (and I have asked their permission). I am sure those of you who were there and all Phish fans can appreciate it. As I write this, I can hear someone blaring a live version of “Fluffhead” down the road. I can only assume they downloaded it from here.